September baseball is the last call of the fantasy baseball saloon, and we’re all desperately scanning the room looking for that last great chance at glory. More often than not — especially if your ERA and WHIP are tanked and all you need is quality — we’re looking down that list of probable starters, looking for a pitcher worth picking up. Even better, a pitcher we could pick up and actually keep for his last few starts, something to keep us from blinking through the beer goggles of desperation again tomorrow. Let’s take a look at some of the lesser-owned pitchers and see if any of them separate themselves. In terms of strikeouts and walks, Musgrove looks like he should be owned in all leagues. His 17% strikeout minus walk percentage would be a top-20 number if he qualified, but is he more Drew Smyly (17.1% K-BB) or Matt Shoemaker (16.9%)? One of my theories was that Musgrove was around the plate too much. By PITCHf/x, he throws his pitches in the zone 3.4 percentage points more often than the league average. And this is with a below-average first pitch strike rate. My thought was that he needed to flip those rates and get strike one more often, and then leave the zone behind a bit. In his Oakland start, PITCHf/x said he had the second-lowest zone% of his career, and his two best first-strike rates have come in the last two games. Too bad for our narrative: His game at Texas included two home runs and five earned runs in fewer than five innings pitched. It was the second time Texas had seen him. Did they figure out his weird sinker? Doesn’t look like it. Musgrove only threw three the first time he saw the Rangers, so it would be strange if that was enough for the whole lineup to figure out the pitch. However, Musgrove threw his frisbee slider a lot in both starts, and in the second time against the Rangers, they had a .500 isolated slugging percentage on sliders they put in play. It’s the curve that’s usually hit hard, though, with the highest line drive and home run rates. Maybe he should drop that and focus on the change or slider. The fact remains that he has four decent to good pitches, a ton of deception and good control, if not command. I’d use him against Cleveland, but that Rangers start between the Indians and Athletics is too risky for me. The Rays righties came back after missing all of last year and most of this year, and his first start was against Toronto, which was not normal. Why not wait another couple of days and not have him debut against a Murderers Row? He did fine, though, with seven strikeouts, one walk, and two earned in five innings. If you look under the hood, though, the stuff has been affected by the time off. 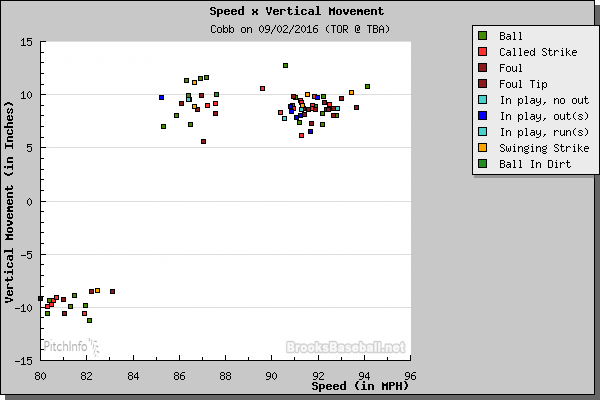 Cobb really took off in 2013 and 2014, when his fastball velocity was consistently sitting 91+. He was up to 91.7 in 2014. He averaged 90.6 mph in his start against the Blue Jays, and velocity for a starter returning from the DL stabilizes very quickly. That’s something to watch in his next start. In terms of movement, his split and curve had some of the worst horizontal movements of his career. The worst news, though, is that split got none of the drop that makes it so great. I thought maybe it was a classification issue, but if you look at this chart, you’ll see that there’s definitely a mid-80s pitch that’s not his sinker but also didn’t get any drop. You see that third pitch in the middle? That’s his split finger. Generally speaking, his splitter has gotten seven to nine inches more drop in the past. He has to figure that out or he’s unusable and that’s just a flat slower sinker. No way I’m throwing him against the Yankees and then Toronto again. The Bradley curve is hard (80+ mph) and has above-average drop, but it has bottom-tenth spin rate. It all adds up to decent a swinging strike rate (13%) and a strong ground-ball rate (66%), so let’s not focus on the spin too much. It’s a good thing he’s throwing the pitch more and more as time goes on. The problem is everything else. You might have guessed from his walk rate, but none of his pitches carry good ball percentages. His (high spin rate) four-seamer and curve get good whiffs, but his change (9% whiffs, 14% is average) is not good so far. He’s had some better starts recently, and the walks were down in those, but there was no pitching mix or movement change, and though it does look like he moved on the mound, it was back to where he was before. Even though it’s amazing Bradley had a good start in Coors, I can’t figure out why. With San Francisco’s offense struggling, I might pick up Archie for his next start, but it looks like Los Angeles and a drop after that. Another baby D-Back! I actually thought at least a couple of their pitchers would work out, so the joke’s on me as much as anyone, and Shipley was one of the guys I had my money on. When I talked to him in 2014, he had a new spike curve grip and was sitting 93 with his fastball. The change was supposedly ahead of the curve, so I was optimistic that the new strikeout rate he was showing that year in the minors would stick. It didn’t. And now Shipley is sitting 90.7, which is below-average for a righty. The curve is getting better results than his change, and is a good out pitch now, but the change is not. It has little separation from either of his fastballs in movement or velocity. The good news is that the change is getting slightly more whiffs recently, and Shipley also gets lucky in that he misses the Dodgers. The Giants and then the Rockies at home, and San Diego on the road? That might be enough to make him the only pitcher so far worth picking up and holding, at least based on the schedule. Talent? We’ll see. I’d be nervous in 12- and 14-teamers. 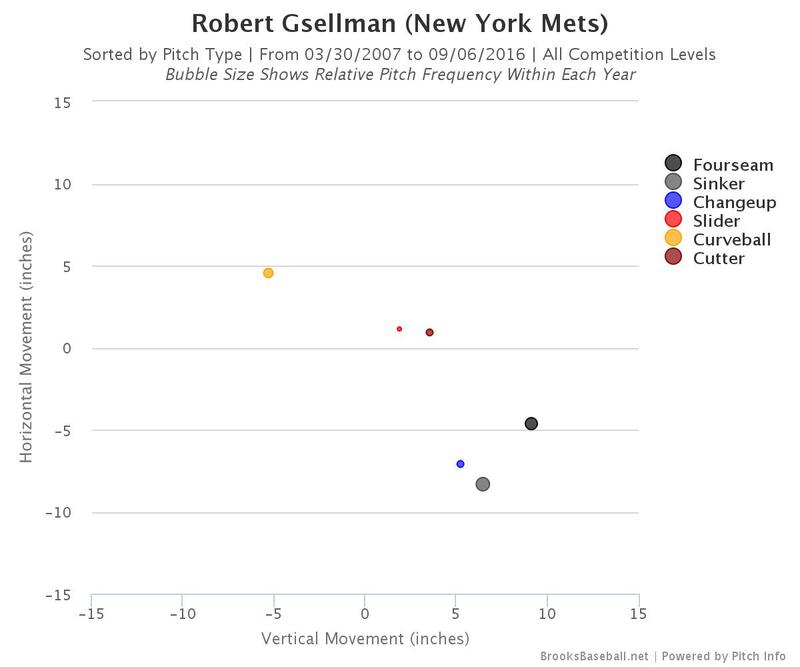 Maybe it’s not surprising to hear that, by whiff rates at least, Gsellman’s breaking balls are the above-average pitches in his arsenal, and that his change is meh. He’s thrown 24 of them and gotten one whiff, and it has less fade than his primary fastball (sinker). Still! Three breaking balls and a sinker could be enough. Especially since he’s 93+ with the sinker. But let’s look to see if he actually has three breaking pitches. I don’t know about calling that slider and cutter different pitches. Maybe an inch or two of vertical movement is all that separates them, and not even a full mph on the gun. Let’s call that his slider and combine the numbers — he still has 39 of those with a 21% whiff rate. And it’s totally a Warthen slider, since it has the drop of an average slider but averages 88 mph. Slider, curve, sinker… maybe it’s less exciting than a six-pitch guy, but all of those three pitches have gotten good whiffs and grounders. And he should have decent command… So why did his swinging strike rate tank in his last start against the Nationals? Perhaps because they stopped swinging at his best secondary, the curveball. That might explain some of his poor strikeout rates in the minor leagues, too. He gets Atlanta next, which is probably a must start because of his balanced arsenal and that Atlanta lineup, but that start against Washington in the series after… I wouldn’t throw him there. You always start with the schedule when it comes to the Padres, so let’s get it out of the way. Looks like Perdomo should get the Rockies at home, the Giants in SF, miss the Rockies in Coors, and then get the D-backs at home. That’s a decent schedule, even if it’s full of divisional opponents that he’s seen before. Unfortunately for narrative, Perdomo has an ERA near seven at home this year, and one that seems totally deserved, since his strikeout rate tanks (13.5%/5.9 K/9) in San Diego. You might think he’s unusable, that’s a defensible stance. However, he’s changed his mix since July began, focusing mostly on his sinker and curve, and using the splitfinger just enough to keep hitters guessing. In that timeframe, his ERA has been a respectable 3.93 and his ground-ball rate has surged to 62.9%. Makes sense, actually, since his sinker is outstanding. Only four regularly thrown (500 min) sinkers average 93 mph and get more drop than Perdomo does. In an NL-only league, maybe he’s gone already. But if he isn’t, give him a shot. And in deeper leagues where volume without pain is your aim, he’s a decent pickup. 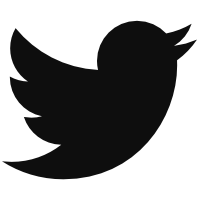 We hoped you liked reading The Change: Finding Pitching on the Fringes by Eno Sarris! BRadley is facing a prospective innings limit. He’s at 157.2 IP now and his high was 152.0 IP back in 2013 before his TJ surgery.